In only two weeks, our baby chicks have already tripled in size. Awkward and pubescent, these feisty creatures will soon graduate from their cardboard box into a proper chicken coop. And what a chicken coop it will be! Our Inspiration: But can it be done? For $0? By us? As you can see, this design has it all: Rainwater harvesting, chicken watering, poultry manure for plants, nesting boxes that can be harvested from the hot house, chicken wire between chickens and plants, north facing heat sinks, cold frames, elements that reflect changes in solar insolation– but is it a unicorn? 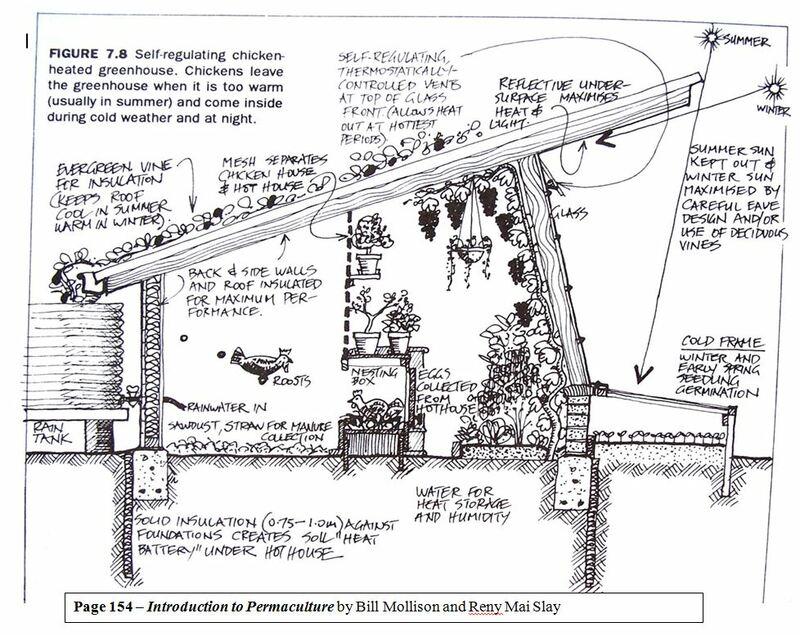 Going online, it was impossible to find blueprints or even real-life examples of passive solar chicken coop designs. This meant that I had to do some math, and develop these beautiful concepts into a concrete plan. It means taking a risk, carefully documenting our work, and hopefully developing a design that would be a point of interest for other farmers. 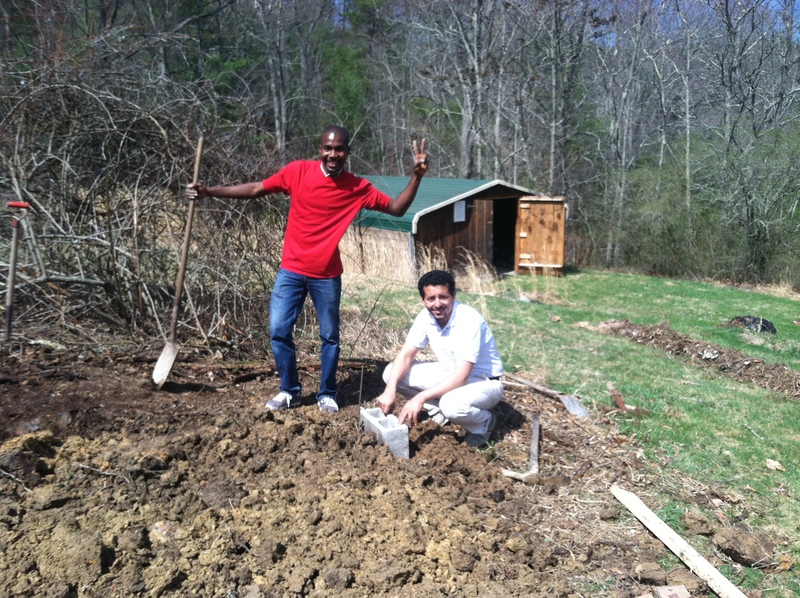 Junior and Nouri leveling out the ground for our foundation. There are many other factors that go into this design. We are trying to do this completely with recycled materials from old farm, with a budget of $0. So far, we’re in the black. We also have little collective experience with building a structure of this magnitude. And it’s an adventure– Nobody on the web has really done it before. So, wish us luck! First, we measured out perfect 8X8 Square, using a T-square and 2X4X8 lumber. We then used a water level and string to determine how to level the ground. We then moved and shifted soil, using the soil we removed to cover hugulkultur beds. 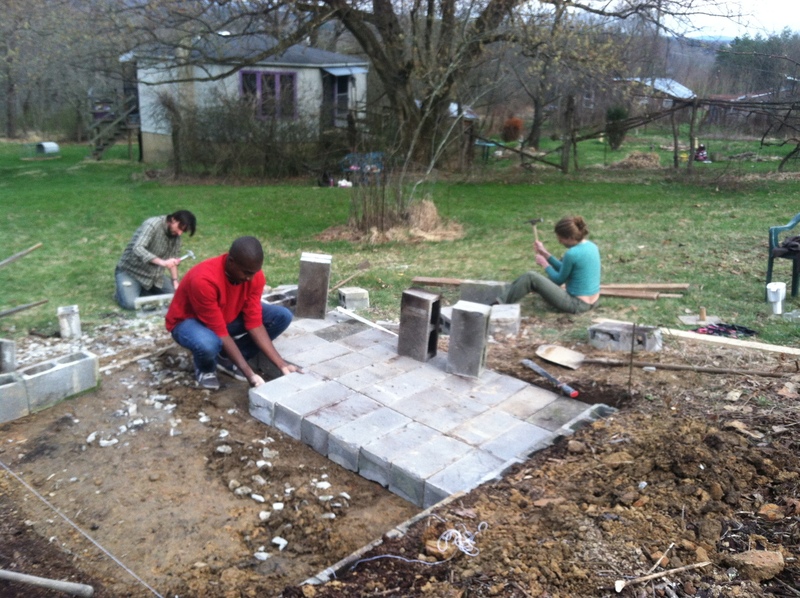 Finally, we took old cinder blocks to create the foundation for our chicken coop. We arranged them to have no holes facing outward in order to deter predators from digging in to our henhouse! We then had a relaxing dinner of Borscht, homebaked bread, fish salad, chicken salad, and cake. Not to mention the great cross-cultural exchange of ideas concerning permaculture and organic farming in a Haitian and Muslim context. Is there demand for Halal organic chicken, anyone? Our solid foundation and solid super-crew! Deep thanks must go two of my students, Nouri Elmeklhi and Junior Beauvais. Nouri is an engineer from Libya- he brought his two beautiful daughters who started cayenne pepper seedlings for us. Junior is a Haitian farmer who actually received a permaculture certificate in the Dominican Republic last year, and has been working to establish a permaculture site in Haiti. These two were a Godsend! 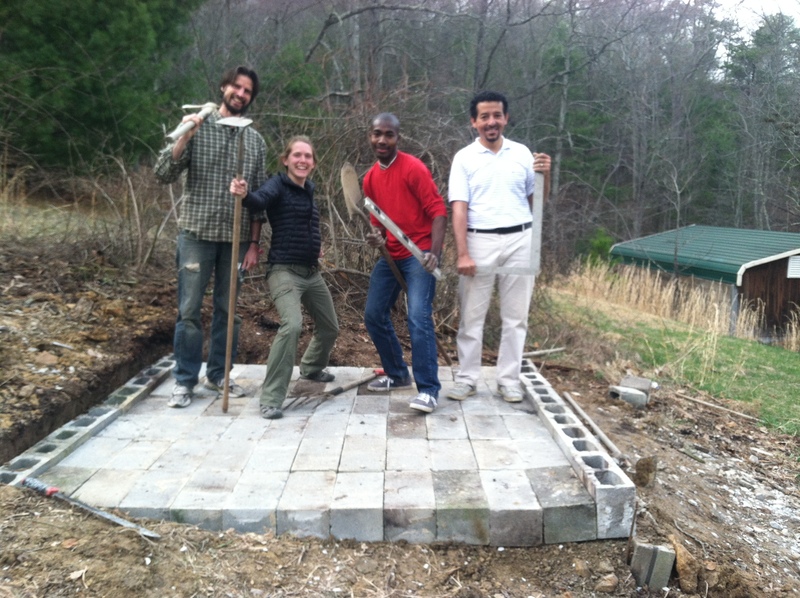 They led the charge today, systematically creating a level foundation for our passive solar chicken house. Thanks must also go to Tim Naylor for turning our tree of heaven into firewood, and to Mike Heitzman for resurrecting our cinder blocks, one chip at a time. 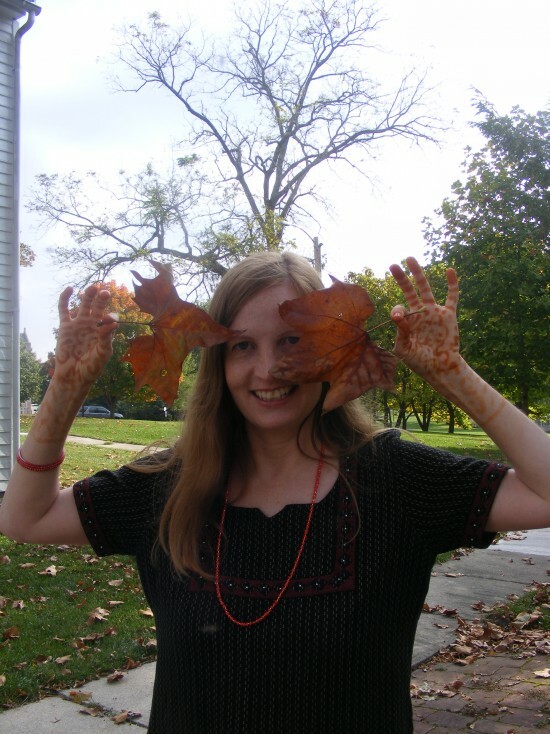 Finally, thanks to Mo for working to fill our “mosquito pit” as we transform it into a Ukrainian Cranberry bog. 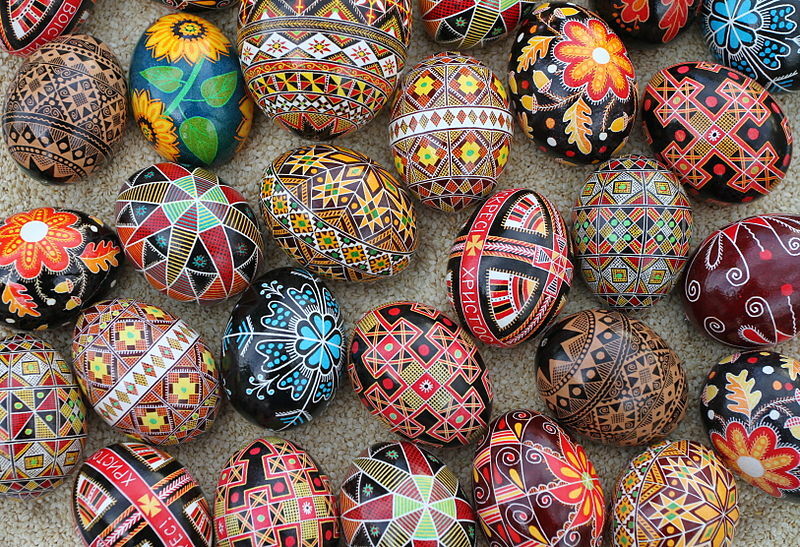 Celebrate spring at the Pysanka Ukrainian Egg painting workshop Sat. 4/12 2-4 pm. Since 2000 years before the birth of Christ, Ukrainians have welcomed the beginning of spring with pysanky, beautiful beeswax batique painted eggs. Come join us to participate in this ancient pagan turned Lenten tradition. Learn the history, symbolism, and techniques of this beautiful art form. Create your own pysanka to take home! Light Ukrainian Snacks Provided! Activist and Master Naturalist Starflower O’Sullivan will facilitate our inaugural Shed Talk about the Keystone-XL pipeline. Activist Starflower O’Sullivan talks about the Keystone XL Pipeline, why it’s a problem, and what we can do about it. Participate in a community discussion following a short film screening of the documentary “Keystone PipeLies Exposed.” Prepare for 350.org protest in DC on 4/26! Chicken coop building to follow.